Hi, Leaders! It’s Adaptation Time! I treated myself to two days of conferencing last week in my own city at the Chicago Forum on Global Cities, which focused on climate and other global challenges. Co-hosted by the Chicago Council on Global Affairs and the Financial Times, the event featured luminaries from 30 countries. The FT’s beautiful salmon-colored newsprint caught my eye both days, first with its special city supplement proclaiming in its cover article: “This would mean that, by the second half of the present century, some big cities could be as much as 10C hotter than their surrounding hinterlands….Many large cities are situated in low-lying coastal areas, leaving them badly exposed to the dangers of flooding that come with rising sea levels and storm surges.” And next with its front page showing an alarming image of central Paris under water. Tubingen, Germany, Mayor Boris Palmer, an erudite crowd-pleaser, proclaimed: “It cannot be about adaptation, it must be about mitigation.” He wisely noted that his success reflects never tiring of explaining the virtue of climate action at a level his audience understands. So here goes, an explanation geared to the panelists on the Global Threats to the Global City, https://www.chicagoforum.org/agenda/plenary-global-threats-global-city (which did not mention climate change once in 75 minutes). The potential exposure of the United Arab Emirates and Abu Dhabi, in particular, to the impact of sea level rises is quite significant, given its current socioeconomic conditions in coastal areas. In addition to the effects of such rises on social and economic structures, the vulnerability of coastal ecosystems is also of particular concern. In the 2011 winter, Chicago incurred over $1.8 billion in losses and 36 deaths when a blizzard dumped two feet of snow on the city. In 2012, Illinois had the second-highest mortality (32 deaths) due to heat nationwide. Twenty-nine percent of bus stations and 26 percent of underground stations are at risk of flooding, along with 14 percent of schools and 27 percent of police stations. The number of days per year when overheating could occur is projected to rise from 18 to between 22-51 days by the 2020s (central estimate is 33 days). From 1972 to 2014, the annual mean temperature increased from 26.6°C to 27.7°C. The mean sea level in the Straits of Singapore also has increased at the rate of 1.2mm-to-1.7mm per year in the period 1975 to 2009. Rainfall has intensified in recent years. Singapore's Second National Climate Change Study found a general uptrend in annual average rainfall from 2192mm in 1980 to 2727mm in 2014. In 2012, damages from Hurricane Sandy required over $3 million in FEMA public assistance grants to rebuild and recover in the District of Columbia. The previous year, D.C. suffered damages from Hurricane Irene that required over $2.4 million in FEMA public assistance grants to rebuild and recover. From Abu Dabhi to Washington, cities have shown a sincere desire to address climate change by mitigating greenhouse gas emissions. That’s more important than ever, and it must be accompanied by a sincere desire to learn about and employ climate adaptation. Why? Because every $1 invested in adaptation avoids $4 in future losses. Tubingen Mayor Palmer, as a member of the Germany Green Party (which puts climate change at the center of all policy considerations, including environmental policy and safety and social aspects), has the splendid chance to again demonstrate leadership by turning his refusal to embrace climate adaptation into an opportunity to embrace it and all collateral benefits for his constituents. Three examples illustrate a need to inspire an adaptation marketplace. 1. the 2015 Paris Climate Agreement, unlike its 20 predecessors, prioritized adaptation & finance. 2. the 2016 Global Risk Perceptions Survey (WEF 2016) ranks failure to adapt to climate change 1st of 28 risks in terms of potential negative impact. 3. UNEP (2015) calculates the adaptation finance gap will be US$140-300B/year by 2030. There is a need for increased funding for adaptation projects, many of which create jobs & stimulate economies as a co-benefit of protecting human & natural communities from the effects of climate change. One barrier is the absence of an adaptation market, a mechanism by which adaptation projects can be traded as commodities, financed by private, government and development investors. This absence is partly due to a lack of a standard measure for adaptation success that would e.g. create tradable adaptation credit, increase adaptation project bankability, and direct finance to short- and long-term adaptation projects. What type of measure is needed to evaluate the potential success of adaptation projects? What types of investment decisions will it influence? Is it the same need for development and private sector investors? Addressing these questions will help to benchmark and establish a draft adaptation Standard in collaboration with the private and development sectors. A nascent investor-lead Global Adaptation & Resilient Investment (GARI) group is attempting to address this need. ND-GAIN & GARI have identified missing knowledge that will spur the adaptation market: a globally accepted project-level measure of adaptation success that assesses progress thereby quantifying opportunity for investors & inspiring a new marketplace that will improve both lives & economies in the face of climate change. The standard will direct investment flows into projects that have climate adaptation & market benefits, inspire investment for adaptation projects not previously considered, credit existing projects, & shape growth of investor tools, such as debt instruments. This standard will be comprised of a unique & efficient set of indicators that measure the success of adaptation investments. Potential indicators will be evaluated against outcomes including avoided death & damage, avoided cost & collateral job, ecosystem & greenhouse gas mitigation benefits. The goal is to reduce barriers and foster growth in a global market for adaptation projects by expanding the number of projects, investors and improved human lives. The ultimate outcome of this Standard will be to inspire a global market for adaptation projects that save lives & improve livelihoods through private sector & development agency investments that help prevent the avoidable & manage the unpreventable in the new era of droughts, super-storms, flooding, fires & other climate stresses & shocks. Let ndgain@nd.edu know if you are interested in joining us in this important work! At NYC Climate Week, Rockefeller Foundation President Judith Rodin and SwissRe Chairman Philip Ryan agreed that cities in lower-income countries had bettered their developed peers in their pluck for climate resiliency. “I’m bullish on the resiliency of emerging cities, which show no fear in taking on adaptive innovations and collaborations that are making them more resilient to current and future climate changes,” Rodin noted. As Ryan pointed out, while there is “nothing more challenging” to his business than climate change, innovative public/private initiatives are poised to present innovative ways to manage just that. And growing city populations in lower-income countries stand to gain a great deal from the leadership their cities are displaying in adopting cutting-edge solutions. In its “Wealthier, Healthier Cities” report, produced in partnership with the Carbon Disclosure Project and C40, AECOM – the global provider of professional technical and management support services – suggests that climate adaptation is a competitive advantage. The report praises the impressive leadership that local governments have taken to spotlight the collateral benefits of climate adaptation for all sectors. Of course, cities are hotbeds of competition. Management consultancy A.T. Kearney, which produces a resilient cities outlook every year, notes that New York, London, Paris and Tokyo remain today's leading cities. But an analysis of key trends in emerging cities suggests that Beijing and Shanghai may rival them in a decade or two. Consider what’s happening in Quito, Ecuador. Its climate-change strategy, formally approved four years ago (Oct. 2009), reflects the number of landslides, floods and droughts the steep-sloped Andean city of 2.1 million residents experience as well as the shrinking of the nearby Antisana glacier. The push for the strategy actually began in 2007 when Quito hosted that year’s Clima Latino, a regional climate-change conference. Quito’s strategy includes both mitigation and adaptation initiatives. Its adaptation program centers on ecosystems and biodiversity; drinking water supplies; public health; infrastructure and power production; and climate risk management. The report draws on global climate models by the Intergovernmental Panel on Climate Change for impacts at similar altitudes and latitudes as Quito. The city has invested nearly $350 million so far in adaptation, using a blend of municipal dollars, international aid and philanthropic funding. In addition, Quito has moved climate adaption into the city’s main development agenda, report outside researchers. While ND-GAIN ranks country level vulnerability and readiness, future plans include a downscaling of the Index, and cities may be our next target. Like corporations, cities are adapting every day, and it is refreshing to know that cities in the developing world are reaping the rewards of nimble and innovative approaches to climate-change adaptation. Their residents are fortunate to have the protection that this preparation affords. Why? Because although avoided costs are harder to quantify at a local level, the billions of dollars spent recovering from climate-related events worldwide serve as an important reminder of the need to act. The pharmaceutical industry will grow as vector-borne diseases adapt to geography changes. Agricultural innovation in seed and fertilizer already is occurring (see BASF an Monsanto) to accommodate not only different precipitation but also varying temperatures. Networking technologies are becoming hotter commodities, especially those that address the growing challenges of resource scarcity, the land-water-food-energy-climate nexus and the increasing impact and frequency of weather extremes. While corporations involved in climate-change work often have been on both sides of the proverbial coin – either as mitigation leaders, looking to reduce greenhouse gas emissions, or climate avoiders looking to avoid prohibitive policy changes, a new generation of climate leaders is emerging. They see the great value in placing adaptation at the forefront of their work, and they’re well positioned to capture real market value from the billions of adaptation dollars out there. 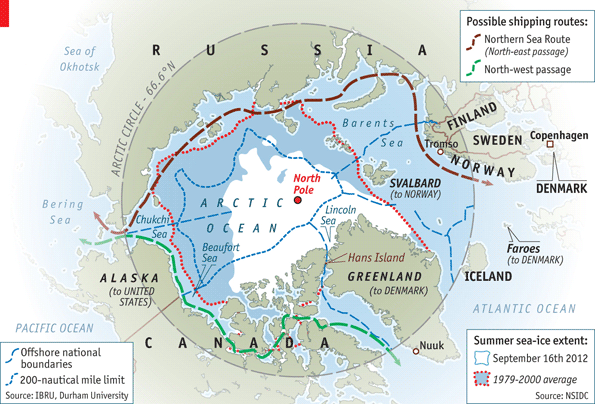 Seeing this map of the melting Arctic Sea and subsequent shipping routes in the Economist a few weeks ago startled me. I was programmed to think of voyages and conquests by the Economist’s cover picture of a ruddy Viking. And this triggered, at least for me, a profound reality: Everything we know about shipping is about to change because of climate change. Just hearing that certainty alone sends an Arctic chill down my spine. I’m not ready to give up that icy white at the top of my son’s globe. Or all the mystery, epoch history, science and beauty locked up there simply to buy get cheaper toys, clothes, solar panel parts, fish protein, energy and the list goes on and on. But ready or not, the draft National Climate Assessment suggests we already are registering a decrease in sea ice, snow cover and glaciers, as well as an increase in ocean temperatures. Indeed, reflecting the physics of glaciers, they are retreating faster than most models originally had predicted. So the climate has created an opportunity for this era’s Genghis Khan to open up trade routes that were a mere child’s dream of racing boats across a plastic globe only a few years ago. I’m heartened to see that a multinational collaboration is taking the lead. The Arctic Council comprises adjacent countries: the United States, Canada, Denmark (representing Greenland and the Faroe Islands), Finland, Iceland, Norway, Russia and Sweden. Corporations are chomping at the bit for the new shipping, fishing and extractives possibilities and a responsible policy will help to ensure safe handling. Time has given the Vikings and Genghis Khan a romantic and heroic reputation as adventurers. Let’s hope the heroism of this new era of profound geologic change leads to two developments: the halt of other climate events through employing greenhouse gas mitigation and a careful and considerate approach to the use of our new geographical landscape.